This Adult Stormtrooper PVC Mask is the perfect way to complement any Stormtrooper costume. The ½ PVC mask has detailed features like smoked lenses over the eyes and intricate blue patterns around the mouth, eyes, and sides of the head. This is an officially licensed Star Wars mask. 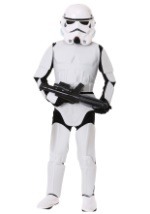 Add this mask and a Stormtrooper blaster to our costumes for a fantastic look!